An ancient method of advertising or communicating is seen in the form of petroglyths at the Newspaper Rock Recreation Site in Utah, USA. 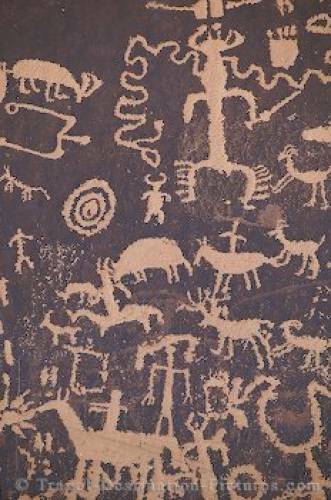 A panel of rock featuring maybe 2000 years worth of etchings or petroglyphs, Newspaper Rock preserves human activity and communications made between various native cultures. Newspaper Rock is situated at the entrance to the Needles district of Canyonlands National Park in Utah, USA. Newspaper Rock petroglyphs, near Canyonlands National Park, Utah, USA. on Newspaper Rock in Utah, USA.